We thought it only fair to throw open the doors to the W* House and share with you how we’d fit out our dream digs. From consoles to cupboards, beds to bookcases, the W* House features our favourite pieces of design from across the globe, room by room. When it comes to sharing our finds, we wanted to keep things simple, letting you furnish your house with the click of a mouse, the Wallpaper* way. Multi-disciplinary Russian designer Katia Tolstykh looked to brutalist Soviet vases and sculptures as the starting point for her ‘Meme’ vase collection. Each of the abstract designs take subtle cues from impressive brutalist shapes, but Tolstykh realises them in a smaller scale, and more playful tones. 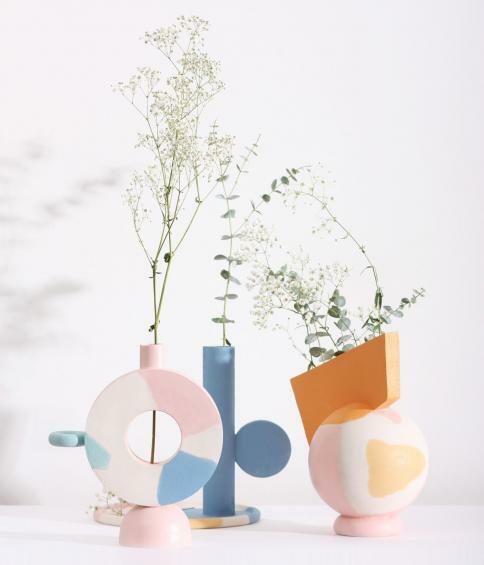 Her contemporary collection uses pastel blues, pinks and oranges to create geometric patterns on the vases for a particularly unique range. In 2012, French designer Inga Sempé contributed a single ’Risotto’ serving spoon to Alessi’s ever-expanding collection of household and kitchen items. Three years later, the IS01 has branched out into a full collection of cutlery, featuring its originator’s slender neck-like stem and softly rounded shapes. 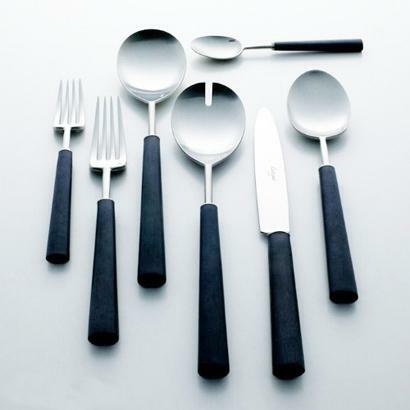 With its bold forms and asymmetrical details, the set includes specific cutlery dedicated to fish or desserts, various serving utensils, ladles and a full collection of 8 spoons that offer different size interpretations of the original IS01. Made of mirror-polished stainless steel, the set combines a sophisticated shape with a slightly humorous design tone resonating throughout the collection. John Hogan’s works blur the boundaries between art and design, with an indefatigably experimental attitude to glass that touches upon traditional techniques and aesthetics as well as uber contemporary shapes. His manipulation of the material’s texture, shape, color, have over the years produced objects that dazzle from every angle. 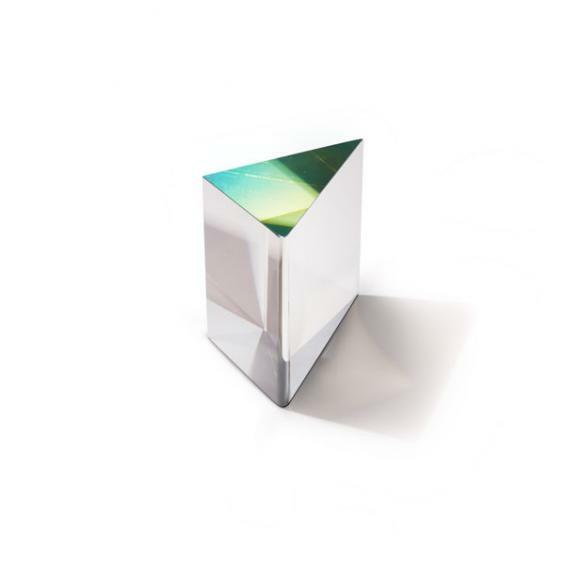 He joined forces with New York gallery Matter to produce his ’Optical Shim’ paperweight, which offer a functional approach to his mesmerising glass exercises. 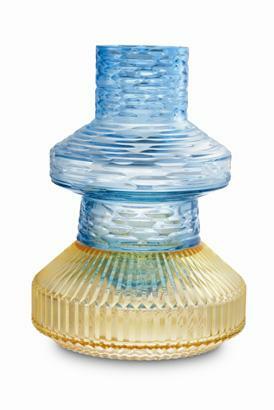 The essential triangular shape of the piece suggests a design purity that is contrasted by the optical illusions of its dazzling top. Part precious objet d’art, part functional item, the piece forms a beautiful synthesis of creative disciplines. Krzysztof Lukasik’s experiments with the compositional possibilities of stone come to a climax with his ’Stratifications’ collection. 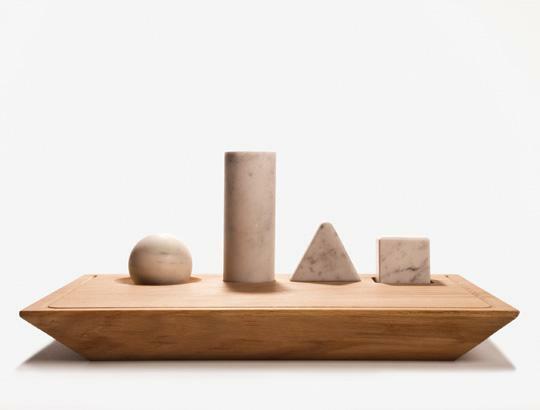 The collection’s essential shapes are achieved by slicing marble and gluing it together like plywood. The tray, made of Mareuil Limestone, is a monumental shape that combines lightness with a rigorous construction. Italian designer Luca Nichetto and Russian designer Lera Moiseeva have spent a long time observing tea rituals from all over the world. Their research has finally come to fruition with the ’Aureola’ tea set, created for Toronto-based design gallery and lifestyle store Mjölk. 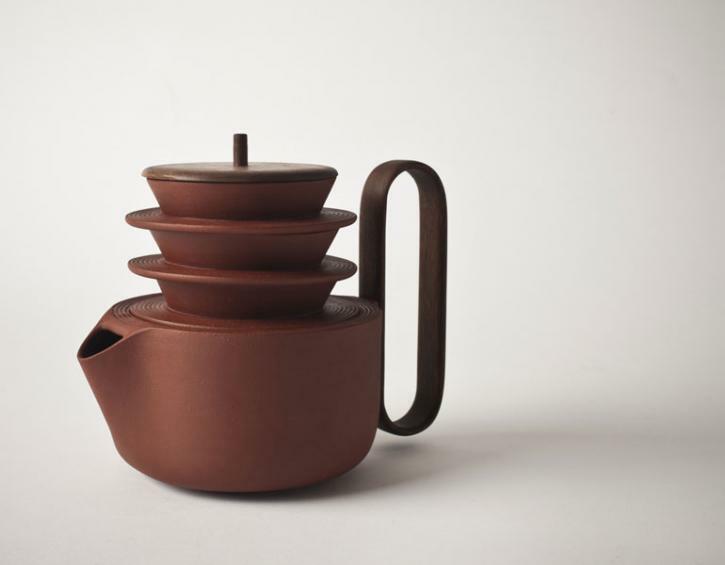 Made of ceramic and wood, the stackable tea set comprises a pot, filter and a pair cups bearing circular graphic details that represent the spreading of the heat in the vessels. Multidisciplinary practice Epiforma was established in Portugal early this year. Its design MO is geometric shapes rendered in bold colours, a simple visual language that’s both eye-catching and minimal. 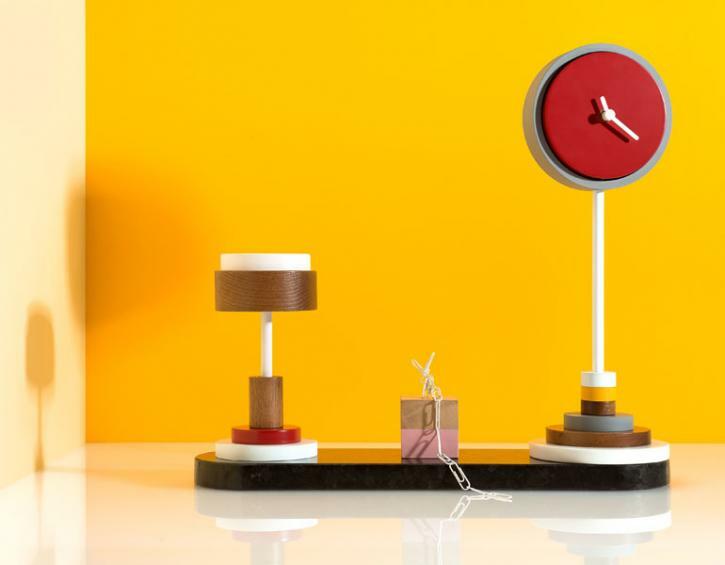 The stackable desk accessories - a clock, container and magnetic cube - are made of black granite, natural wood and lacquered wood, a desktop tribute to the Memphis Group. 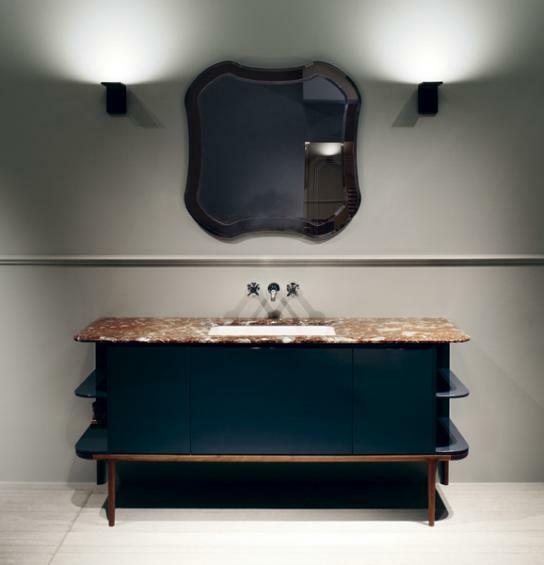 Tuscan brand Antonio Lupi’s new bathroom collection, ’Il Bagno’ designed by Roberto Lazzeroni, transforms a typically clinical space into a homely sanctuary. Functional bathroom fittings have become furnishings with romantic lines, warm wood finishings, coloured lacquered surfaces and midcentury details. Lazzeroni has drawn on the brand’s 50-year history to integrate classic, elegant aesthetics into the new collection, at times updating vintage designs, such as 1950s mirrors, with contemporary materials. The whole collection brings the look and feel of the living room to the bathroom and, as a result, encourages long, lingering ablutions. 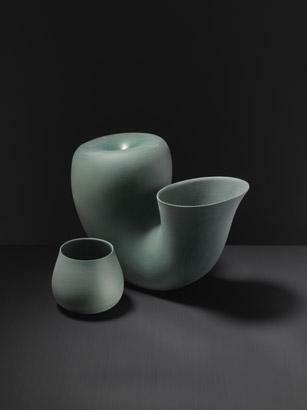 Dutch designer Lex Pott’s fascination with materials and their natural forms is the basis of his intriguing vase collection. The eight cylinders feature copper, aluminium, brass and steel, paired with their oxidised counterparts. It’s a collection that plays on contrasts, the shiny metals standing out against the tarnished pinks, greens and blues. 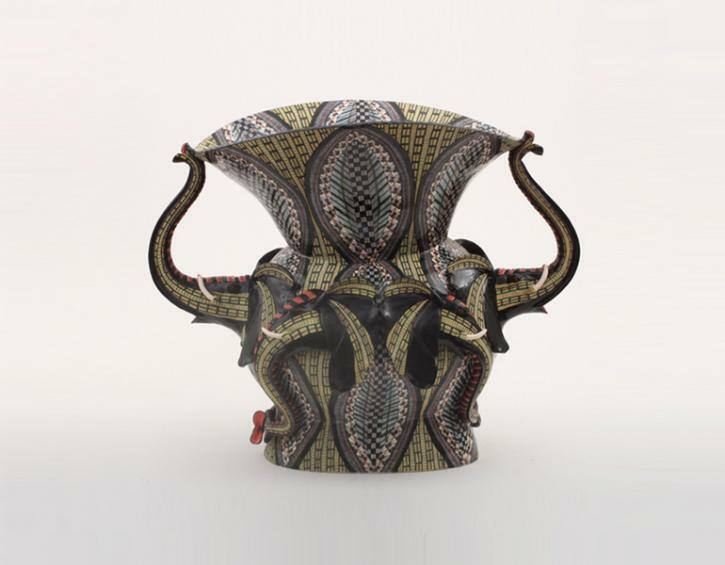 For more than twenty years Fèe Halsted’s Ardmore Ceramic Art Company has been creating elaborate, handmade and hand-painted sculptural pottery inspired by the South African midlands. Tribal patterns, wild animals and intricate silhouettes make for vibrant pieces, many of which have been designed for Halsted’s brother-in-law, silversmith and animal sculptor Patrick Mavros. 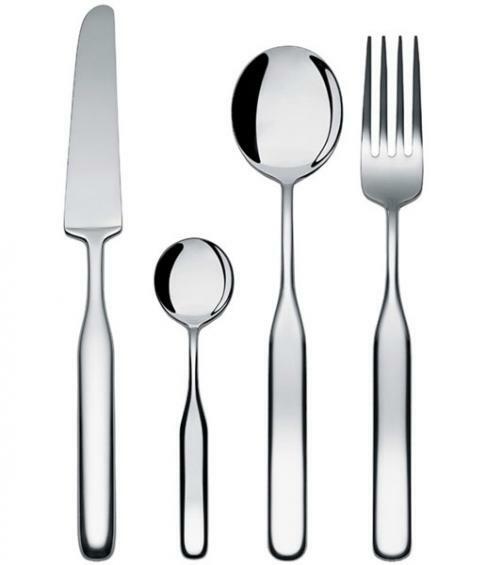 Portuguese cutlery maker, Cutipol, continues to set the benchmark in terms of covetable flatware designs. Its Ebony range is a sophisticated union of wood and metal that evokes elegance and luxury in spite of its simple form. 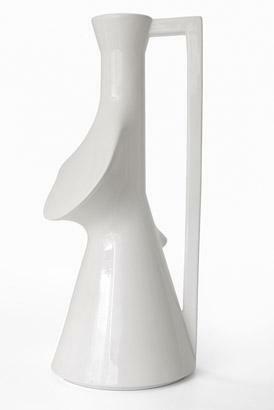 Bernaer Design is the creative force behind this playful set of versatile tableware. The straightforward, yet imaginative collection comes in all shapes and sizes, and accommodates a multitude of uses. Each wooden piece is painted on one side and unadorned on the other, which makes them not only suited to serving hot food, but to doubling up as coasters and trivets as well. This graceful vase was part of a ballet-themed exhibition to celebrate Milan clothing store Dimensione Danza’s 30 years in business. Conceived as a pirouetting ballerina, the vase’s layers of delicate pink blown glass mimic the dancer’s raised arms and tutu. Those searching for a centrepiece with a difference should look no further than ’All of a Piece’, a series that combines decoration with function. Made of marble, granite and wood, its modular elements - a flat tray, shallow bowl, candleholder, semicircleshaped endcap and glowing LED light panel -connect together with embedded magnets. 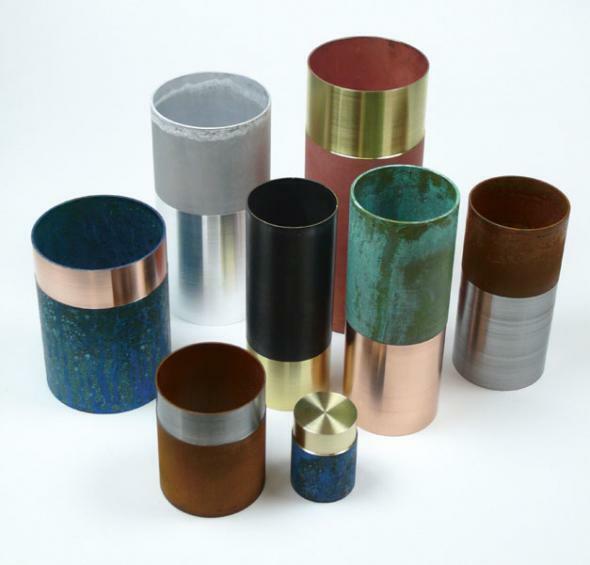 Miranda Watkins’ understanding of materials is key to her working process and contributes to the compelling beauty of these tumblers and cutting board. Each piece is precision engineered in high-grade materials and hand-finished in British workshops. 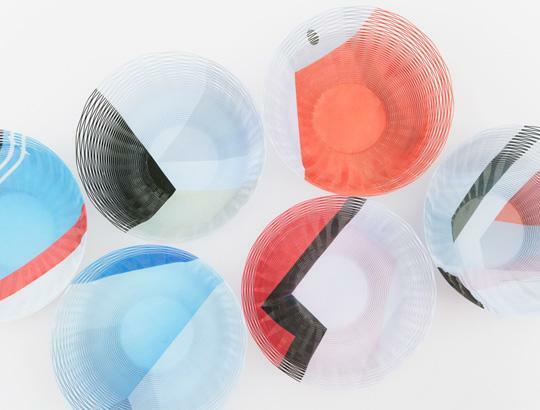 After finding inspiration in graphic patterns and space shuttles, Japanese practice Torafu Architects and photographer Mikiya Takimoto have turned to the Bauhaus movement to design a new variation of their ‘Airvase’ collection. The delicate flat-packed bowls, which gain strength when expanded and pulled, now feature details of the legendary German design school building. 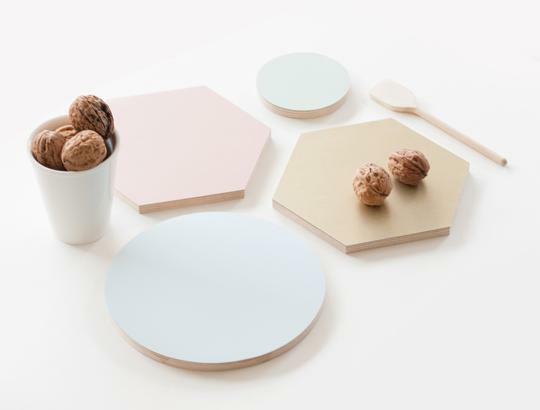 Florence-based Studio Lievito has turned the acts of chopping, crumbling and rolling food into a game with this geometric cutting board. The marble sphere crumbles spices, the cylinder is for rolling dough and smashing meat, while the cube can be used to scale fish, and the prism holds a blade for chopping vegetables. 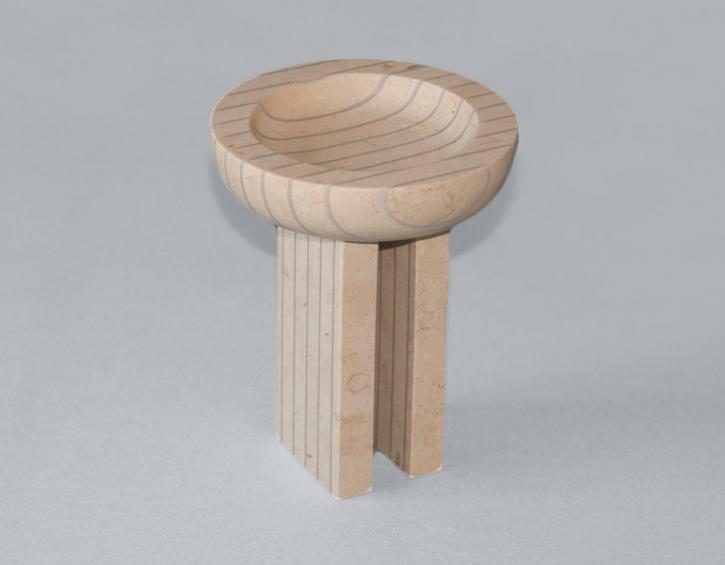 Zoumaras’ work first caught our eye at the Royal College of Art degree show in London. Her work hinges around geometry and symmetry, drawing inspiration from architecture. 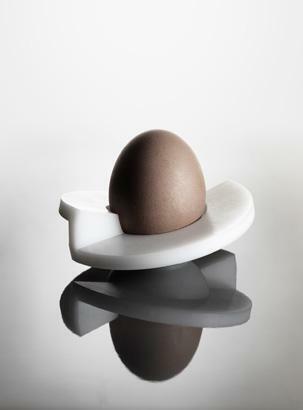 This tabletop creation makes a sculpture out of the humble egg. 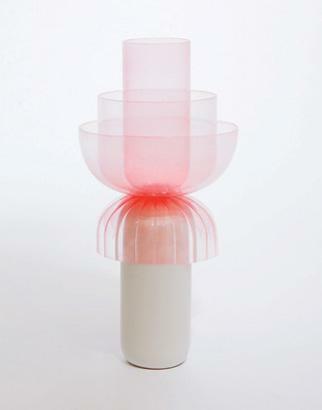 The Variations Collection of vases by Patricia Urquiola for French crystal manufacturer Baccarat teeter somewhere on the brink between object and sculpture. The stackable forms come in two parts, of varying sizes and colours, which can be mixed and matched to eye-popping effect. Each piece has been richly patterned with pleats and cuts, created using glass-cutting principles. 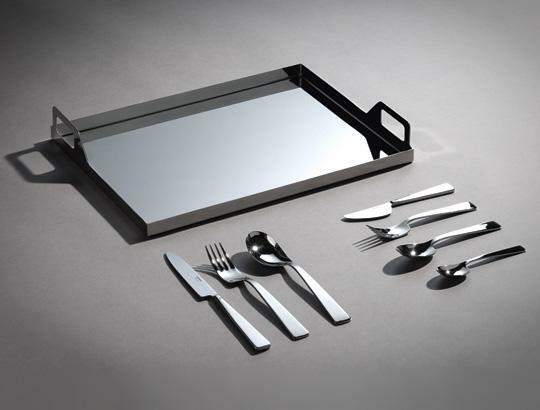 Sambonet has revived an asymmetric cutlery collection originally designed by Gio Ponti in 1951. 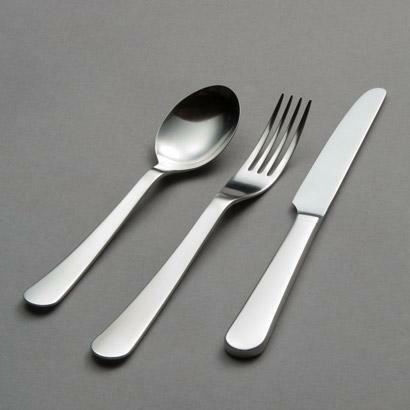 It features shorter prongs and blades to reflect the Italian architect’s observations on the way we eat, often just using the tips of cutlery. The distinctive line is matched by a sophisticated tray made of a single sheet of stainless steel. Now at the helm of his father’s eponymous cutlery and kitchenware company, Corin Mellor has inherited the familial flair for the physics of tools. His new ’Chelsea’ set features subtle variations of thickness and satisfying forms that balance perfectly in the hand. It gets its name from the area where David Mellor set up shop in 1969. The trouble with many modern edition vases is that sans fleurs, they look a little naked and forlorn on the mantelpiece. What’s been lacking is a vase that’s not afraid to go commando, which is why we were instantly enamoured when Milia Seyppel’s buff ceramic series arrived at Wallpaper* HQ. Made of pigmented stoneware, the vases have a geometric elegance about them, and when grouped together, the resemblance to the silhouette of an industrial factory is striking -- which is appropriate given Seyppel’s fondess for the mechanical form. 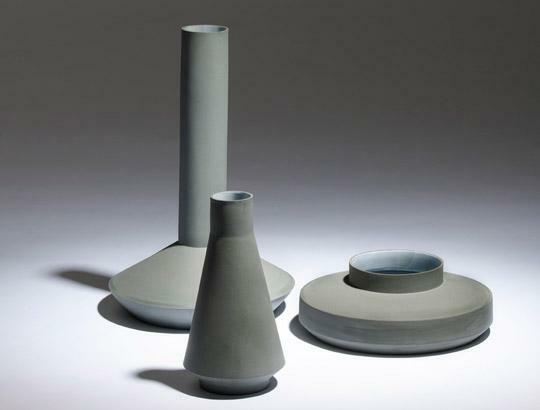 So confident are these vases in their less is more approach that they don’t even have a name. Clearly, roses are optional. It’s impossible to pigeon-hole Aldo Bakker. When it comes to the materials he uses for his designs, this young Amsterdam-based designer is that rare breed that is equally at home crafting from copper, wood or glass. We’re very much looking forward to the results of his current collaboration with French porcelain manufacturer Sèvres, but judging by Bakker’s set of porcelain cup, and jug shaped like an Aztec antique that we spotted at this year’s Salone del Mobile, we’ll be eating off new table-ware pretty soon. The fact that the set is available in five different colours only makes it all the more covetable. India has long been a fruitful source of inspiration for HermÈs, and for his latest collection of glasses, artistic director Yves Taralon turned to the former French colony of Chandernagor (present day Chandannagar). 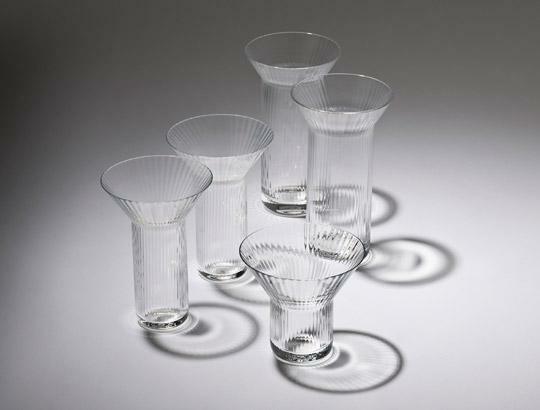 The resulting set of clear water glass, wine goblet and tall glass reminds us of ancient Venetian goblets especially in the way the slender ribbed stems flute outwards into a wide rim. 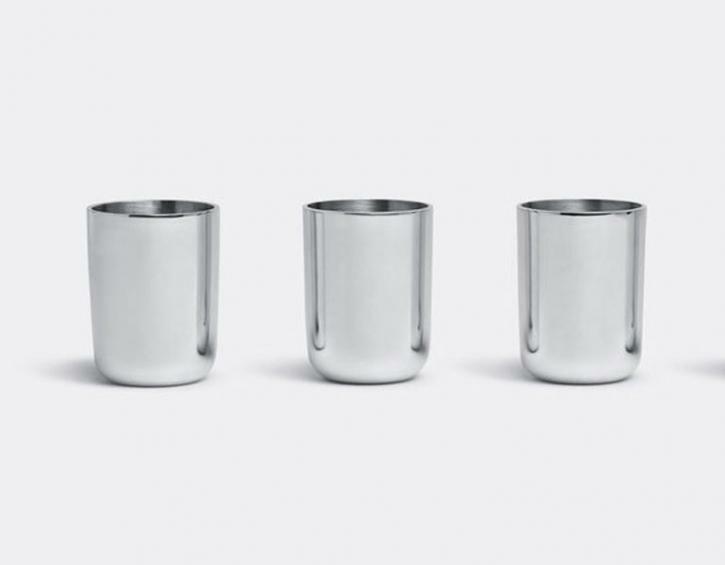 Taralon designed the Chandernagor to accompany Bleus d’Ailleurs, HermÈs’ new line of tableware. With a table setting this pretty, you’ll find any excuse to keep the dinner party going. Not to sound like we’re stuck in some Renaissance-era time capsule, but it’s a real shame that more designers don’t craft in stone. Properly worked, this rugged material adds gravitas to any domestic setting. 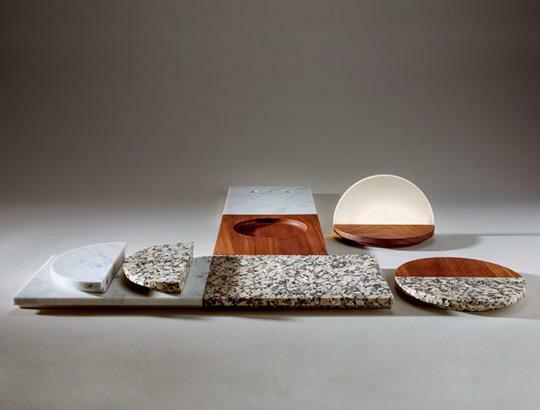 Case in point is this tactile set of tableware collaboration between Portuguese stone specialists Sienave and the UK-based designer Michael Sodeau. Natural stone from Sienave’s private quarry in Algarve’s Monchique Mountain has been painstakingly cut to form bowls, plates, vases and cups that look equally good on the dining table or as decorative pieces. 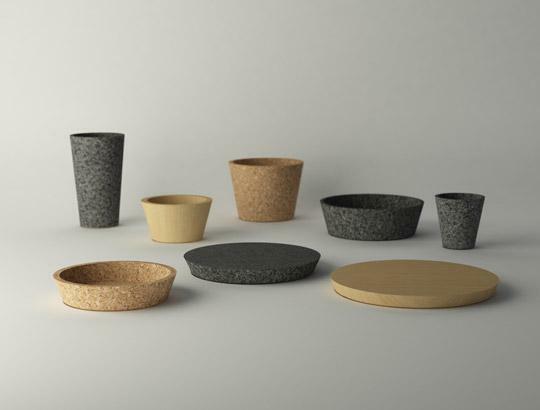 Unadorned, their simple lines are pleasingly primitive, but the genius in the collection is the pairing of other equally natural materials such as oak and cork to provide interesting soft and hard textures. As overused as the word ’organic’ is, especially in the context of design, it’s nevertheless an apt description for the pitcher that the Argentinian-Swiss designer Alfredo Haberli created for Georg Jensen’s new Masterpieces collection. Two openings provide the shape of the titular peacock -- the short end, the head, and the taller end, the folded up tail. Or at least, that’s how we’re seeing it. Either way, the pitcher’s polished glossiness is the perfect foil to the other pieces that Haberli designed for the collection, including a glass carafe whose stopper is a wooden spinning top, salad bowls in porcelain and stainless steel, and a charming pair of oak salad servers. The ubiquitous tea-light candle has much to commend it. Its compact form throws off flattering light, and its sensible price point means it’s a doddle to give any party an instant louche intimacy. That said, we’ve never really taken to its cheap metal casing. 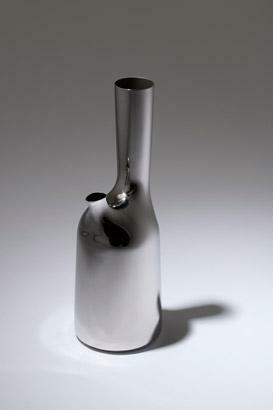 And neither, it seems, has the Australian London-based industrial designer Marcel Sigel. These statuesque candlesticks have a shallow insert into which a standard tea-light candle is dropped providing instant camouflage of the casing. A disc acts as a back reflector. For now, Sigel, who used to work with Tom Dixon, is only producing the Swoon in small numbers and in pairs of black or white. Dining table centerpieces that err on the safe side of posies of flowers and candles can stop a soiree dead in its tracks even before the canapes are served. Happily for us, the Danish textile designer and Rhode Island School of Design alum Margrethe Odgaard has the solution for pulling off a great dinner party every time. 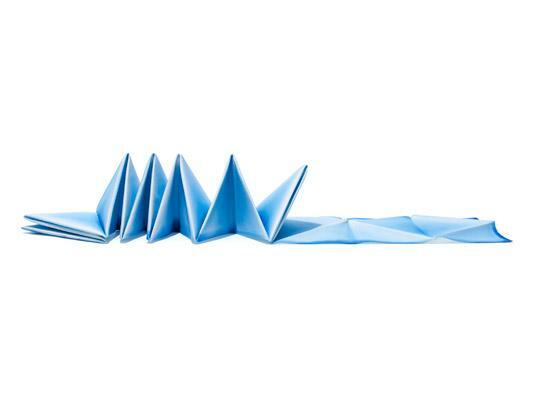 What looks like an innocuous stack of triangular-fold napkins pulls out like an origami fan into a three-dimensional table runner. The resulting shape varies in endless permutations depending on how much you unfold the 400cm length of sugar-starched cotton. Available in pink, green and blue, we dare say you’ll have the whole table talking and in a good way. 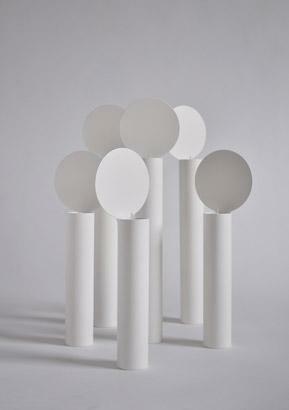 usual symmetry of ceramic turning to pleasingly irreverent effect.